A wealthy man from India has just arrived by ship with an idol containing a valuable jewel, The Eye of the Idol. 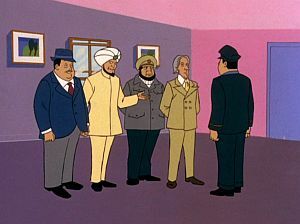 When a distraction results in the jewel being removed from the idol and stolen, Charlie Chan and the Chan Clan snap into action, sifting through a number of suspects. It's always nice to have a family reunion - but not in a police station. Don't worry, justice will prevail.